Callais, who was so impressed he subsequently founded Cruzely.com, a resource for cruise travelers, experienced what cruise lines have increasingly noticed: young adventure travelers in search of thrilling escapades were an untapped market. While luxury lines such as Crystal Cruises tout "unparalleled posh elegance in a sanctuary of refined style," Royal Caribbean is using frenzied music and fast cutaways in ad campaigns to show its audience just how much action is really in store. 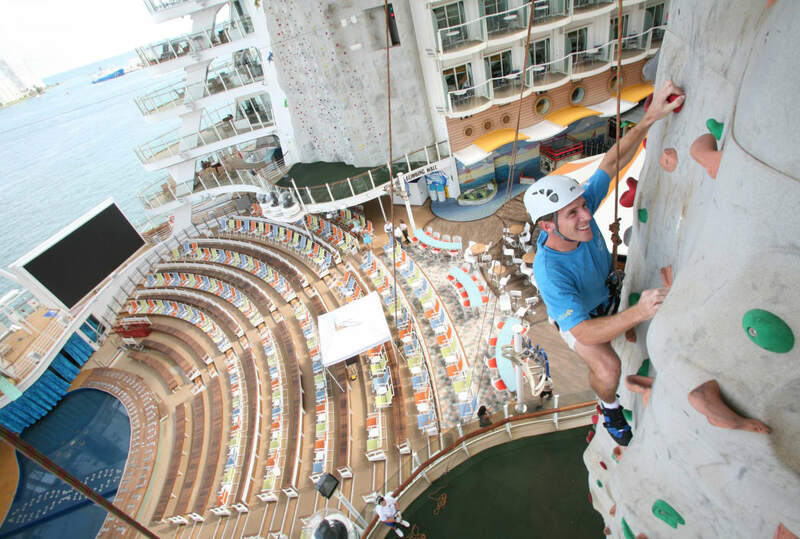 In fact, Royal Caribbean, a cruise line which positions itself as "the world’s most adventurous," began targeting multi-generational travelers interested in more than the buffet when it introduced the first rock-climbing wall aboard a cruise ship in 2009. Its increasingly millennial clientele sees cruise lines as more than simply a floating hotel with pool, spa and umbrella drinks. Soon the cruise line began offering more adventure, from surfing, skydiving and Zip-lining, to a partnership with PADI that allows passengers to become scuba-certified onboard. Even on its private island near Labadee, Haiti, Royal Caribbean introduced thrills. It’s now home to the world’s longest over-water Zipline. “This is 500 feet high and a half a mile long and I’m scared of heights,” says one British millennial, who filmed the action with a GoPro. Royal Caribbean recently launched a new marketing campaign, "Come Seek," which is “all about adventure,” says Stephanie Holder, a Royal Caribbean spokeswoman. Chockfull of millennials, it’s all but telling you to pack your bags for action, and not the kind found at the pool bar. Not to be outdone, Norwegian Cruise Line has a three-story ropes course and "99 exhilarating challenges" aboard the Escape, with a multi-level sports complex that invites passengers to suspend themselves on one of five Sky Rail zip tracks or walk “The Plank,” which extends a heart-stopping eight feet off the side of the ship. Onboard fun is great, but what happens when it’s time to disembark and explore? While booking packaged excursions through the ship is convenient, they can be crowded and pricey— and sometimes lack the authenticity of a truly local experience. Thanks to the Internet and social media, the power offshore is back in the hands of passengers. The onset of companies such as Viator and ShoreTrips that specialize in day trips and shore excursions in hundreds of destinations has changed the offshore cruising experience, allowing passengers to organize local experiences for themselves. Even AirBnB’s new Experiences portal provides opportunities for cruise passengers to tap locals directly for access to the best trails, beaches and more. A quick search yields adventurous choices like off-road adventure tours, deep-sea fishing, Mayan ruins exploration, whale shark encounters and eco adventures. Once a haven for senior citizens in search of scenic, leisurely wine-tasting, even river cruise lines have upped their game when it comes to active adventures. AmaWaterways pioneered the idea of active river cruising in 2006 when it added a permanent fleet of 25 bicycles onboard all its European ships, and incorporated "active" walks and vigorous hikes to the menu of excursions. Then in 2015, the cruise line partnered with Backroads active travel, which applied its seven-day biking trip model to river cruises. Guests experience onboard life as regular passengers, then bike anywhere from 11 to 43 miles a day on custom titanium road bikes at various destinations. "When we announced our first active river cruises aboard AmaWaterways, they immediately sold out," says Backroads spokesperson Liz Einbinder. “We increased the number of departures and those sold out, as well,” she says. The Backroads passengers typically number about 30 and are a subset of ship guests, in addition to entire ship buyouts for 150 Backroads guests (next one is September 2017). "Throughout the past several years, we have noticed the use of bikes has risen dramatically and our guests are asking for more challenging hiking options." Heightened interest in active travel spurred the company to launch a Wellness Program with sports scientist Selina Yanks, which AmaWaterways rolled out earlier this year on the Paris to Normandy itineraries. In 2018, AmaWaterways plans to roll out the program on several more ships, then possibly fleet-wide in 2019. Needless to say, we’ve come a long way from shuffleboard on the Lido deck. If you’re looking for affordable, active travel, and an easy way to visit multiple destinations in one trip, cruising may be a more viable option than you once thought.